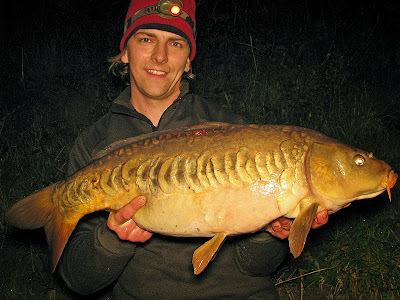 I managed to pick a couple of days break in the early-May rain, to fit in a 24-hour session with Shane Calton. 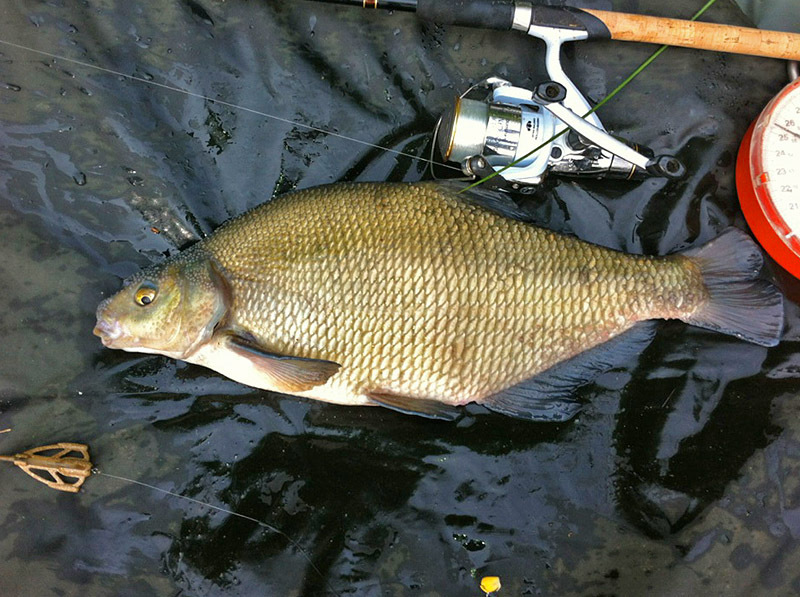 We visited Derbyshire's Higham Farm Lakes and tackled up primarily for tench, but with the head of carp, bream and other species in there, we knew it would be difficult to target them solely. Higham is pretty local to me, so I used to fish this place quite regularly for the carp when I was 15 to 18, but I worked out that I have only been there once in the last 12 years! I was field testing a fair bit of Cyprinus night fishing gear, including a bivvy, a memory foam bedchair, a 3-5 season sleeping bag and a tackle barrow, which all performed superbly (Reviews on FishingMagic.com here). Before I arrived Shane had already landed a few bream in the 4-5lb bracket and as I was setting up he landed a tench of exactly 5lb, which was a very promising start. It was to be the last tench we had between us, but we each notched up carp overnight and I also had a bream and a strange fantail brown goldfish-cross thing, which I should have really taken a photograph of, though I have caught similar fish from Higham in the distant past too. 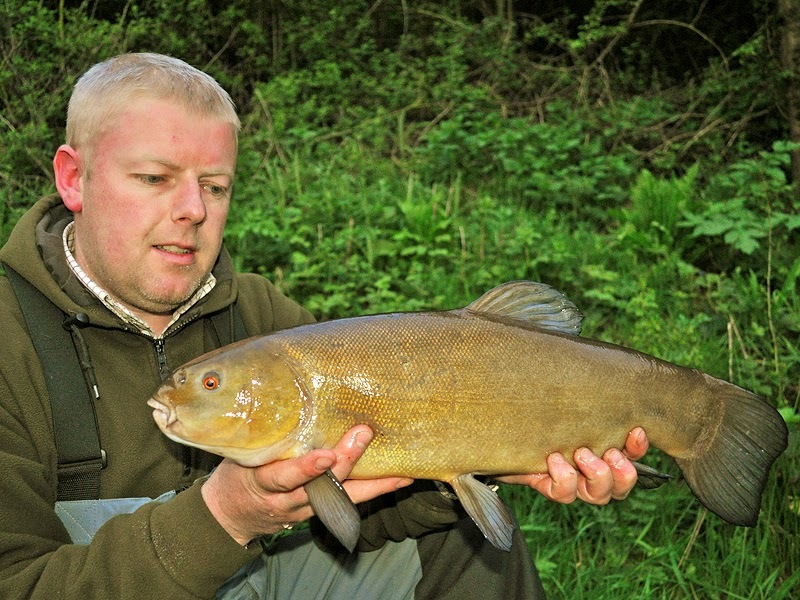 I had one breakage and two hook-pulls in the night, which were either the mothers of all tench, or more likely carp. Overnight I was setup on both rods with 6lb mainline through to 5lb fluorocarbon hooklengths to size 14 Drennan Power Hair Rig hooks. 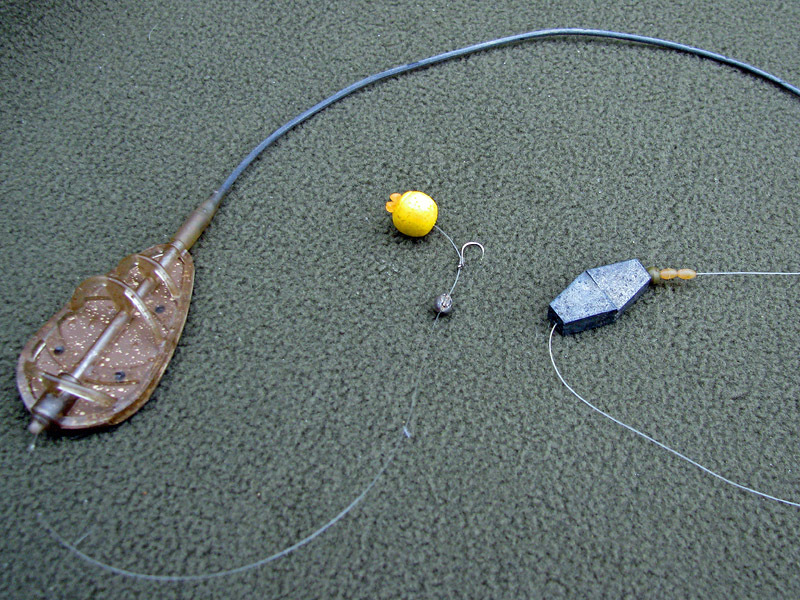 One rod had a helicopter rig above an open-end feeder and I alternated between corn and meat on this rod whilst on the other rod I rigged up a small method feeder and baited this with a 10mm pineapple & banana pop-up which Shane kindly provided! 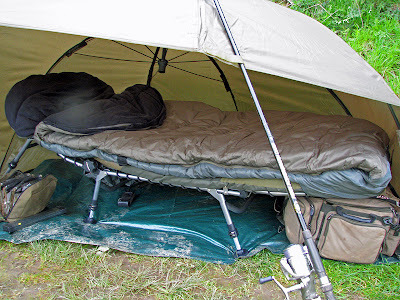 Just as I was settling into my sleeping bag to get some sleep, the alarm on my margin rod - which had its bait placed just in front of a small bush - screamed out as a fish tried its best to swim between every root before I could lift up the rod. As soon as I felt the rod I knew I was connected to a decent fish which was a huge worry, what with my 6lb mainline being dragged through the roots! Thankfully I kept my calm, kept the rod tip underwater and applied steady sideways pressure. I think the fish had run out of ideas, as one-by-one I felt the line 'ping' off each root, my heart fluttering a little each time as I though it was the hook dislodging. I gradually felt more in contact with the fish and was able to coax it out into open water where I could tire it without fear of it finding more snags. Shane did the honours with the net and we both gasped as we realised this fish was a little bigger than either of us expected. It was a beautiful mirror of exactly 18lb. 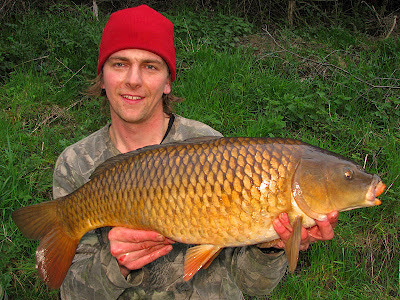 My biggest carp for quite some time, although I rarely target them these days. 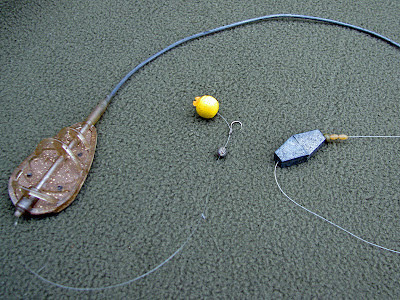 The following day I alternated between taking photos of the gear I was reviewing and fishing on the surface with this floater rig. I ended up taking another 3 carp off the top and lost a couple too. After a pretty terrible winter campaign it felt great to be on the bank catching, in fairly pleasant surroundings (I saw a few buzzards, jays & a treecreeper and had a field mouse visiting my groundbait bowl). Surface fishing got my juices flowing big-time! And when I latched into this 14lb common on my last cast, I actually caught myself smiling as the drag slowly "ticked" as the fish took line several minutes into the fight. This year, for probably the first time ever, I was really glad that the river coarse fishing season was over. There's no hiding from it; since the beginning of November I'd had a real stinker of a season and smiles have been sadly lacking from my fishing for longer than I'm happy to accept. But if this session was anything to go by, the spark is back and I'm loving my fishing again; at last!